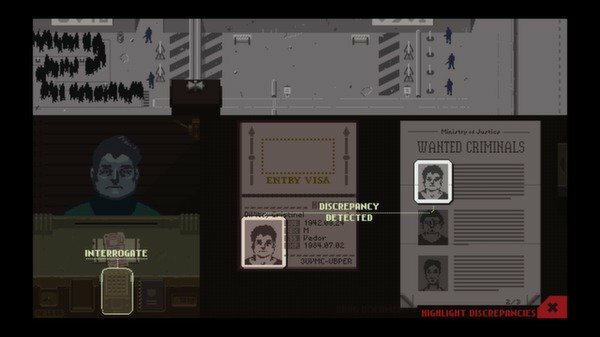 For the next day, the indie game and former Steam Greenlight project Papers, Please is $6 instead of its usual $10. You should stop reading the article and go buy the game if you're looking for a new kind of puzzle game. 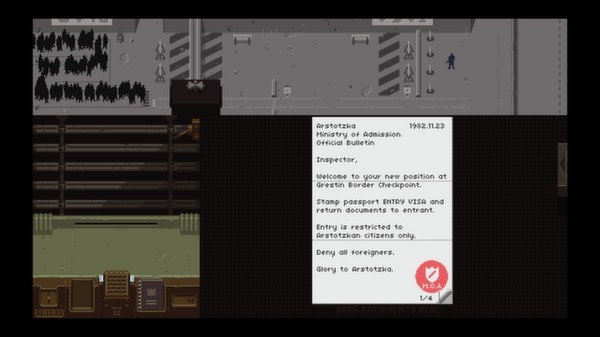 In Papers, Please, the player is a border control inspector for the fictional Eastern European country of Arstotzka. It's your job to make sure that terrorists, spies and other undesirables don't get into the country. The way you do this is by analyzing their immigration documents to ensure that there are no discrepancies. For example, an immigrant's passport might have the wrong photo or be from an invalid issuing city. I realize how boring this all sounds. 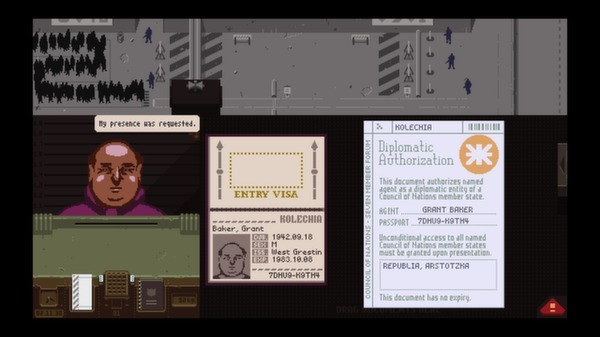 I've tried to explain Papers, Please to a lot of people and the response is generally laughter. 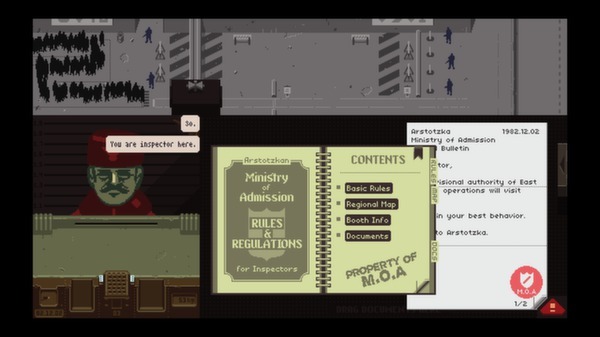 A game about a clerical worker does sound absurd on its surface. Video games are supposed to be about escapism, aren't they? Tales of pirates and space marines and commandos? Right? 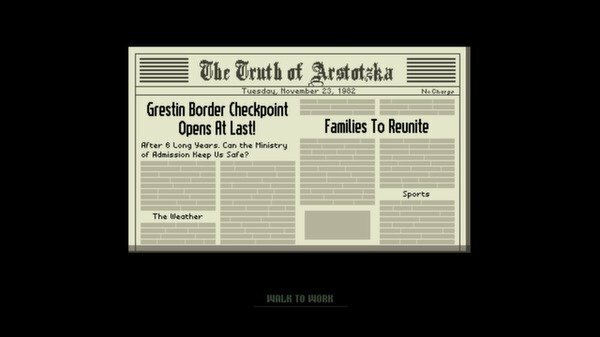 That's what's so great about Papers, Please, though. It puts you in a job that might be even more boring than your own job and makes it absolutely engrossing. 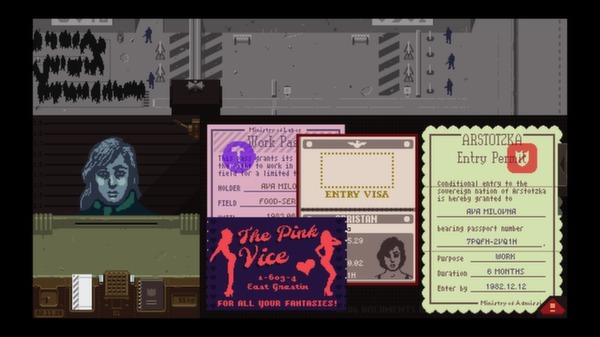 After introducing you to the basic duties of your job (checking for expiration dates and proper stamps), the game begins placing more responsibilites on you. Soon, you're not just checking photos and dates - you're also scanning these immigrants for hidden objects or checking their fingerprints against records. What's more, you're doing all of these tasks on a timer. The more immigrants you correctly inspect in a given day, the more money you earn for your family. If you don't earn enough money, they'll have to go without food or medicine that they need. If you can't pay the rent on the apartment housing them all, you're off to jail. The result is that you're scrambling to complete as many inspections as possible while minding all of the new regulations announced every day. It's one of the most intense puzzle games I've played in awhile. If you're interested in picking up the game, you can find it at Steam.